This antique dress is possibly for a child or early teen. The empire waistline has a snap closure, and the buttons are for show. Underneath the buttons there are snaps that were added after the hooks and eyes, that are still present. The material is an unusual silk brocade that has a striped appearance. The collar is incredible handmade lace, even the back of it is stunning. The sleeves do have a slightly drop shoulder construction and there is piping around the shoulder seam. You can see from the photos there is wear and repairs under the arms, in the bust area, and some tearing in the back left shoulder. This item has really not been laundered but comes from a smoke free environment. It does have an antique odor. There are a few other areas of splitting in the fabric mainly on the blue portions. This piece also does have a right hand pocket. There is no label and no lining in the skirt portion. In the hemline of the skirt, mainly in the back, there is a 3 to 5 inch wide cotton stitch on to the hem. Measurements taken when dress was lying flat and are approximate. I doubt this is for a child with a waist of 30" and a bust of 36". That's your average uncorseted size 8 to small size 10 today. Given the higher waistline, the slightly longer length at the back, and the overall style, this is probably post American Civil War. 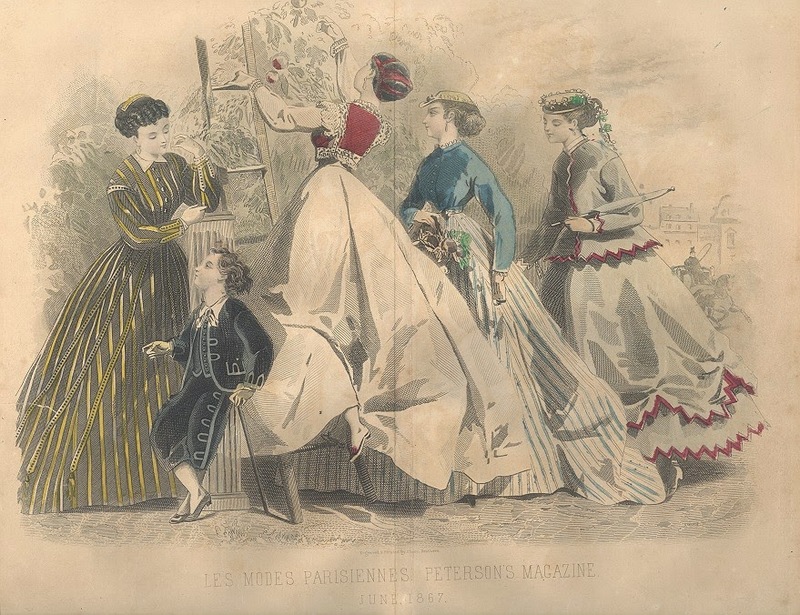 The above is a fashion plate from 1867. The striped gown on the left has a similar cut to the extant one.